In the fall of 1974 I made my first dive on a Pacific coral reef. But unlike what you might imagine, it didn’t take place in Hawaii, Fiji, Australia or any other tropical isle where the sea was as warm as bath water. My dive took place in the chilly depths off Southern California’s Catalina Island, on a site called Farnsworth Bank. Much to my surprise, what I witnessed on that bright September morning was one of the most beautiful coral formations I’d ever seen. Lying before me were what seemed to be hundreds of square yards of purple coral (Allopora californica). Not soft coral, but the hard stuff. And it rivaled many of the reefs I’d seen up to that time in some warm-water destinations. Most people — and certainly most divers — are amazed to hear that corals, the ubiquitous creatures of warm tropical paradises, can exist in such chilly water. But as it turns out, the deep, cold sea may hold more varieties of corals than in all the tropics of the world. Moreover, through cutting-edge deep-sea diving technology, science is only now beginning to realize their importance to the blue planet we call Earth. Unlike their better-known tropical cousins, cold-water corals are generally found in the deep cool depths along the edges of continental shelves. They can also be seen in very deep water at the bottom of fjords, around offshore submarine banks, and near hydrothermal vents and seamounts. Also, unlike their tropical counterparts, which can’t tolerate water below about 68 degrees Fahrenheit (20 degrees Celsius), these guys thrive in temps of 29-55 F (minus 1.8-13 C) (seawater can still be liquid at temps below 32 F [0 C]). While most live at depths between 660 feet (200 m) and 3,300 feet (1,000 m), some species, like the famous residents off California, can live as shallow as 132 feet (40 m) or less. At the other extreme are species found at depths few research subs can reach, at around 21,000 feet (6,367 m). Like tropical reefs, deep-sea coral reefs occur in all the world’s oceans. So far, besides being found in international waters, they’ve been discovered in the territorial seas of 41 countries including Japan, Spain, Seychelles, New Zealand, Mauritania, Canada, Australia, Colombia, Brazil, Norway, Angola, Russia, Sweden, United Kingdom, Ireland, and the United States. Although most research so far has been done in high latitudes, where cold-water reefs occur in some locales at shallow depths, cold-water species also thrive in tropical waters at greater depths. Both tropical and cold-water corals belong to the phylum Cnidaria, which is derived from the Greek “cnidae” (named for the prickly nettle plant). Their unifying characteristic is that they all have specialized stinging cells called cnidocytes. As you may remember from high school biology, this group of organisms also contains the sea anemones and true jellyfish (or more correctly, sea jellies). As those with more than a passing interest in tropical reefs may already know, most hard corals seen by divers contain endosymbiotic algae collectively called zooxanthellae. Like all plants, these algae convert sunlight, carbon dioxide (waste from the coral polyp) and water into food by photosynthesis. The algae essentially serve as tiny “food factories” within the coral tissue. But corals also use their tentacles, and the stinging cells within, to capture some of their food. This makes most of the species we see on a tropical reef, in a sense, both an animal (a creature that captures prey) and a plant (a creature that manufactures its own food by photosynthesis). Scientists call this dual way of feeding mixotrophy, as opposed to autotrophy (the self-feeding of plants) or heterotrophy (the other-feeding of animals). Corals that lack the symbiotic algae, like all cold-water species and even some common tropical species like orange cup coral (Tubasrtraea), are termed azooxanthellate (without zooxanthellae). Not having symbiotic algae creates both an advantage and a problem. Living mostly in the dark, or at least too deep for photosynthesis to occur, cold-water corals can feed only on the plankton and other organic matter they can capture with their tentacles. As a result, they tend to have much larger tentacles than their tropical zooxanthellate cousins. But not having to worry about photosynthesis, cold-water species are free to populate depths far below the reach of sunlight. Like all other corals, geological records of cold-water species go back millions of years. But even existing colonies can live to an incredible age. Amazingly, radio carbon dating has shown that some living colonies are up to 8,000 years old, far older than any warm-water colony. So far, scientists have recognized 672 species of stony corals that don’t need zooxanthellae to survive. Therefore, all of these are candidates to live in deep water. Furthermore, some of these species host zooxanthellae in the shallows but survive quite well on their own in water 130 feet (40 m) or deeper. As a result, marine scientists now tend to use the term “cold water” rather than “deep water” corals, although most cold-water corals do live farther down in the oceans. Deep-sea corals are very diverse and include members of several major groups including the hydrocorals, black corals, true stony corals, sea fans, soft corals, sea pens, and a little-known group, the stoloniferans. Hydrocorals, or lace corals, (Hydrozoa, Stylasterina) require hard substrate for attachment and form either erect or encrusting colonies. The common fire coral seen on shallow tropical reefs is a hydrocoral. Like their tropical cousins, they are calcareous (made of calcium carbonate). Some species grow to one meter (three feet) in height. The hydrocoral, Stylaster campylecus, is a major component of Aleutian Island coral gardens, while the California hydrocoral (S. californicus) forms extensive beds in the Southern California bight. Other species of Stylaster form important reef structures in the deep waters off Florida; and colonies have been discovered in waters off the Galapagos Islands, in the north Pacific and the west Atlantic. One group of cold-water corals familiar to many divers is the black corals (Anthozoa, Antipatharia), which can be locally abundant in deep water. Unfortunately, they’re not so abundant in shallow water, in part, because black corals are harvested for the jewelry trade. Hawaii provides the only commercial harvest in U.S. waters. However, they’re not found only in Hawaii, but in the deep slopes of the Atlantic and Pacific continental margins, as well. While many groups of deep-water corals provide structure, only a few deep-dwelling true stony corals (Anthozoa, Scleractinia), most notably Lophelia pertusa, actually form “reefs.” And boy, do they form reefs. Lophelia reefs extend for 2,800 miles (4,480 km) along the European continental margin, stretching from Norway around the British Isles and south to Spain and Portugal. By comparison, this dwarfs the 1,200-mile (1,920-km) “largest coral reef on Earth,” Great Barrier Reef of Australia. In fact, one single Lophelia reef off Norway’s Lofoten Islands, the largest single reef discovered to date, covers an area equal to Manhattan (39 square miles [100 sq km]). They’re also found extensively throughout the Atlantic, in such far-flung regions as the coast of Spain, the Caribbean and parts of the Mediterranean. A dense belt also exists from the southwestern Barents Sea along the eastern Atlantic down to West Africa off countries as far south as Mauritania. Another belt was discovered along the western Atlantic from Nova Scotia to the Florida Strait and into the Gulf of Mexico. The most shallow-living colonies are found in only 130 feet (40 m) in Trondheimsfjord, Norway, while the deepest so far are in more than 10,800 feet (3,273 m), in the North Atlantic off the New England Seamount Chain. Another reef-building species known to some divers is Oculina varicose, which occurs from the Caribbean Sea, the Gulf of Mexico and the Atlantic from Florida up to North Carolina. The largest colonies form huge mounds by consolidating broken coral and sediment into hard carbonate structures. These mounds can expand as a colony for decades or even centuries. These are true deep-sea coral reefs, which provide essential habitat for many invertebrates and commercially important fishes. The 300-square-nautical-mile Oculina Habitat of Particular Concern (HPC), established in 1984 by the South Atlantic Fishery Management Council off the coast of Florida, was one of the first cold-water coral banks to receive a protected status. Neither bottom trawling nor even anchoring are allowed in this zone. Off the U.S. west coast, Scleractinian species form mostly solitary cups. Sea fans or gorgonians (Anthozoa, Gorgonacea) are widespread structure-forming corals, and are common on seamounts and exposed, hard bottom. Like black corals, gorgonians are often abundant but patchy in their distribution. Some species, especially those in the genus Primnoa, grow to a massive size of more than several meters, and are found commonly in Alaska. The New Zealand native Paragorgia arborea can reach 33 feet (10 m) in height. Gorgonians form both single- and multi-species assemblages. Also, like black corals, several gorgonian species, such as the red coral (Corallium rubrum), are prized in jewelry making, and have been widely sought after since the time of the ancient Greeks. True soft corals (Anthozoa, Alcyonacea), like their gorgonian cousins, require exposed, hard substrate and also can be locally abundant, though patchy. Found throughout U.S. waters, they don’t appear to be a very diverse deep-water group. Perhaps the species best known to cold-water divers are the Pennatulaceans, or sea pens (Anthozoa, Pennatulacea). Unlike most of their relatives, which require hard substrate, sea pens are uniquely adapted to living only in soft-sediment bottoms. They secure themselves by burrowing into the sediment and anchor by peristaltic contractions. Unlike other soft corals, these animals can easily rebury themselves if displaced from the sediment. As many divers from the Pacific Northwest can attest, sea pens can comprise extensive groves over the bottom. A commonality among tropical and cold-water corals is that both provide vital habitat for a mind-boggling assortment of critters, including sponges, polychaete worms, mollusks, crustaceans, brittle stars, sea stars, sea urchins, bryozoans, sea spiders, fishes, and many other vertebrate and invertebrate species — many of which are still unknown to science. And with the development of sophisticated deep-sea vehicles and undersea camera technology we are gaining incredible insights into the deep coral reefs of the sea. In addition to forming reefs, some cold-water species create forestlike three-dimensional structures — often called “gardens” — performing functions comparable to warm-water species in both size and complexity. These cold-water ecosystems act like islands in the normally flat, featureless and muddy bottom. These cold-water habitats harbor distinct and rich communities, providing vital niches and nursery grounds for a range of species, including commercially important fish. Like tropical reefs, cold-water coral reefs are important both for biological diversity and fisheries. 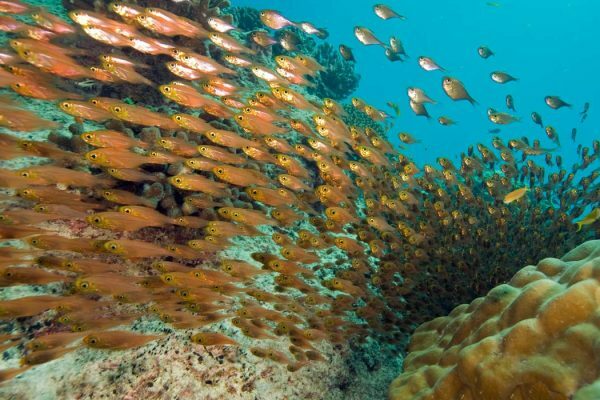 Some Lophelia reefs have been shown to be home to more than 1,300 species of fish and invertebrates. Scientists have documented large numbers of commercially important but increasingly scarce species — like grouper and rockfish — among the shelter of many deep-sea coral reefs. Furthermore, because they’re so long-lived, cold-water corals provide a vital record of past climate conditions on Earth. (See the sidebar “Using Deep-Sea Corals to Understand the Past.”) In fact, although they’ve only begun catching the attention of researchers since the 1990s, many scientists already believe that cold-water coral communities are as important to the biodiversity of the oceans (and perhaps even more important to the sustainability of fisheries) as their better recognized tropical, shallow-sea counterparts. It’s believed that habitats that support cold-water corals rarely encounter natural disturbance, so it’s not surprising that their growth and reproduction appear to be exceedingly slow. In fact, some species live for centuries or even millennia, making them and the habitats they create extremely slow to recover from disturbances. Just as science is beginning to explore and understand the importanceand vulnerability of these ancient cold-water coral communities, technologies have become available that can literally wipe them out in the span of one human lifetime. Many conservationists are now concerned about deep-sea oil and gas development. 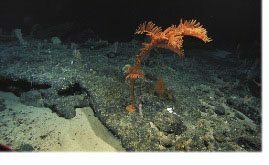 Oil and gas drilling operations can crush deep-sea corals or smother them in toxic debris at drill sites. Pipelines that service drill sites may also destroy deep-sea corals. Likewise, concern has been raised over deep-sea mining, and even changes to deep ocean circulation from global warming. 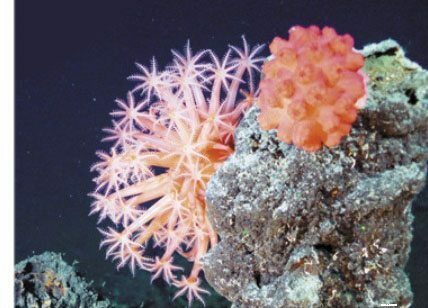 While damage from mineral exploitation and climate change is a significant concern, by far the greatest threat to cold-water corals is destructive fishing practices, particularly bottom trawling. Trawling drags enormous weighted nets — sometimes with gigantic wheels — across the seafloor, devastating sensitive bottom habitat, including deep-sea coral reefs. When fishes and invertebrates that depend on these coral structures lose their habitat, they have no choice but to move out of the area. The actual damage done by trawling, scientists hypothesize, may be a decrease in the size of the habitat with a corresponding decrease in the abundance and biodiversity of the associated species. However, with continued trawling, complete destruction of the coral habitat occurs. What were once functioning habitats appear more like bombed-out cities. Moreover, the trawlers also re-suspend sediments that can smother coral communities growing downstream. Because research into cold-water coral habitats is so new, it’s unknown whether deep-water reefs can repopulate an area if they are so nearly destroyed. Additionally, the problem is compounded as trawler technology becomes more sophisticated, and fleets chase commercially important fish from shallow areas, giving incentive to fish deeper. What has become clear to science, however, is that many if not most cold-water coral habitats have been negatively affected by trawling. And given the global range of cold-water reefs, this is an amazing and troublesome statement. For example, Norwegian researchers have verified that between a third to one-half of their cold-water coral reefs have been damaged by bottom trawling. And the news is no better from other regions of the world; recent surveys have confirmed that an area of the world’s seafloor equal to twice the size of the continental United States is trawled every year; and some popular trawling grounds can be harvested several times in one year. Although research on cold-water corals is still in its infancy, the results already demonstrate quite clearly that these ecosystems are important biodiversity hot spots and a biological resource with not only intrinsic but significant socioeconomic value as well. But they provide these benefits only as long that they remain healthy and vibrant communities. So, the next time you hear a call to “protect the reef,” don’t just think about your last tropical vacation. Consider those that inhabit the deep, cold ocean, as well. Like tropical corals, the growth rate of cold-water corals depends on a variety of factors. For example, not only do growth rates vary from one species to another, factors such as variations in food supply can cause the same species to grow at different rates in different locations. Like all other corals, geological records of cold-water species go back millions of years. But even existing colonies can live to an incredible age. Amazingly, radio carbon dating has shown that some living colonies are up to 8,000 years old, far older than any warm-water colony. Seamounts are underwater mountains rising more than 3,300 feet (1,000 m) above the surrounding seafloor. There, scientists have found untold biological diversity, so these are especially exciting sites for deep-water coral reef research. In one Australian study alone, seamount researchers found 850 new species, a whopping 42 percent more than were discovered in the past 125 years of seamount research. And of the new species discovered, 34 percent were probably endemics. Many other species, including pelagic fishes, seabirds, and marine mammals, also concentrate above seamounts. Seamounts are ideal homes for filter-feeding animals because of the presence of currents, which bring with them ample food. The current also sweeps away sediment, revealing rocky outcrops on which corals can settle and grow. Cold-water corals tend to concentrate on the tops of sharply peaked seamounts rather than the slopes. However, on flat-topped seamounts corals also reside along the perimeter, provided the current is strong. Likewise, strong current also assists with the distribution of larvae, but the newly formed colonies don’t necessarily come to rest hundreds or thousands of miles downstream. In many cases, the currents above a seamount can develop into a circular eddy called a gyre. This phenomenon helps entrap larvae and prevents them from drifting away from the seamount. Seamounts are especially critical habitat to many commercial fisheries. An excellent case in point is the popular orange roughy (Hoplostethus atlanticus). This species has an exceptionally low productivity and long life history, making it incredibly vulnerable to overfishing, mainly because of the type of fishing gear used. Bottom trawls damage delicate structures such as deep-sea corals, and can utterly destroy other sensitive sea bottom. In a sense, given their isolation, seamounts can be viewed as “undersea islands,” as many of the species found there are endemics — occurring nowhere else. This makes seamount communities exceptionally vulnerable to extinction, especially if activities such as bottom trawling are allowed. Conservation organizations are now pressing the United Nations to impose a moratorium on high-seas bottom trawling to protect seamounts, but so far there is little or no protection in international waters, and only a few nations are considering such a move in their own seas. However, the United States recently prohibited trawling on the Davidson Seamount; and the North Pacific Fishery Management Council has afforded some protection from bottom fishing for seamounts in the Gulf of Alaska.